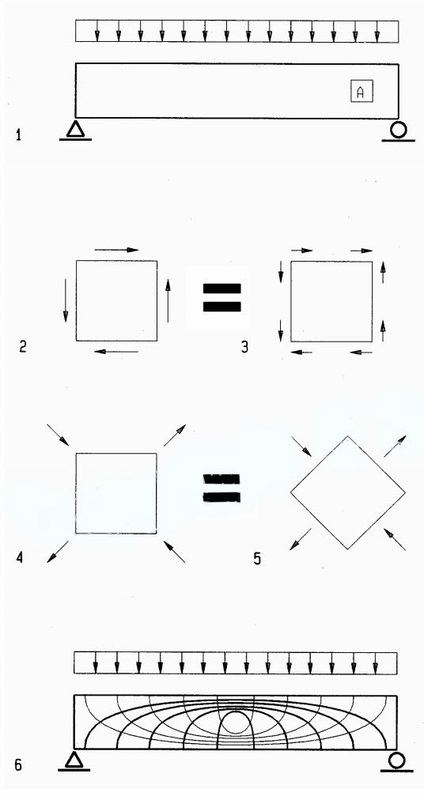 Shear stress in one direction, at 45 degrees acts as tensile and compressive stress, defined as principle stress. Shear stress is zero in the direction of principle stress, where the normal stress is maximum. At any direction between maximum principle stress and maximum shear stress, there is a combination of shear stress and normal stress. The magnitude of shear and principle stress is sometimes required for design of details. Professor Otto Mohr of Dresden University develop 1895 a graphic method to define the relationships between shear stress and principle stress, named Mohr’s Circle. Mohr’s circle is derived in books on mechanics (Popov, 1968). Isostatic lines define the directions of principal stress to visualize the stress trajectories in beams and other elements. Isostatic lines can be defined by experimentally by photo-elastic model simulation or graphically by Mohr’s circle. Under gravity load beam shear increases from zero at mid-span to maximum at supports. Beam compression and tension, caused by bending stress, increase from zero at both supports to maximum at mid-span. The isostatic lines reflect this stress pattern; vertical orientation dominated by shear at both supports and horizontal orientation dominated by normal stress at mid-span. Isostaic lines appear as approximate tension “cables” and compression “arches”.